All season long, PFF will be ranking the best performing NFL rookies as they race for Rookie of the Year. See where all of our rookies racing to finish with the highest grade found themselves on our mid-season All-Rookie Team. Below is our weekly rookie rankings after the Week 12 games. PFF Elite Stat: Lattimore has allowed just 0.74 yards per coverage snap this season, the 10th-best rate among 119 qualified cornerbacks. 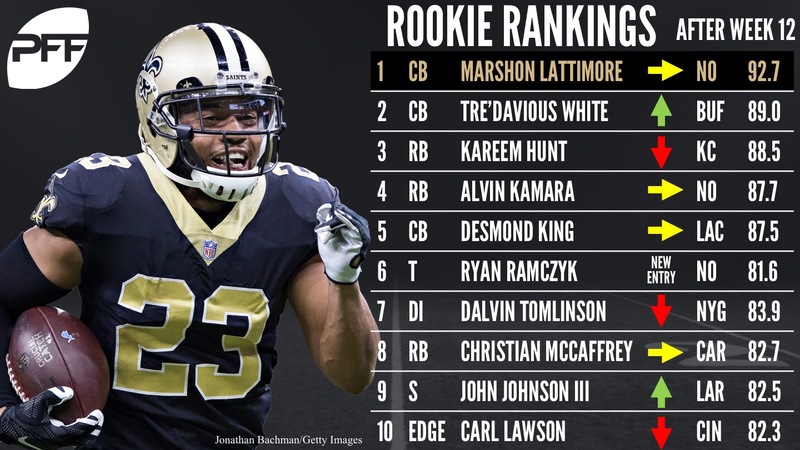 Lattimore continues to lead our season-long race for the PFF Rookie of the Year award with his elite overall grade but this is looking like it’s going to be a fun race down the stretch as we have seen some remarkable performances from this year’s rookie class. Lattimore ranks fourth among corners in terms of overall grade and he’s one of just 32 players in the entire league – regardless of position – to possess an elite grade (anything over 90.0). Opposing quarterbacks have just a 47.4 passer rating when throwing into Lattimore’s coverage this season, the fourth-lowest rate allowed by any corner through the first 12 weeks. PFF Elite Stat:White has allowed a catch just once per every 14.3 snaps he’s spent in coverage this season, the 17th-best rate among all corners. White passes Kareem Hunt in this week’s update to reclaim the second spot on this list for the first time since Week 6. White’s overall grade for the season now ranks seventh among all cornerbacks and sits just below that illustrious elite level after he posted an 84.1 overall grade against Kansas City – his sixth game over 80.0 this season. White has been incredibly consistent as a rookie, finishing just one game all year with an overall grade south of 70.0 and he’s been one of the very best in football when it comes to breaking up passes: White’s been directly responsible (whether it be via pass breakup, interception, proximity in coverage, etc.) for an incompletion on 25 percent of the targets into his coverage this season, the ninth-best rate among all corners and nearly double the league average of 14.7 percent. PFF Elite Stat: Hunt has forced a league-leading 47 missed tackles on rushes this season, the next closest is Le’Veon Bell with 34… Bell has carried the ball 68 more times than Hunt. The NFL has long been referred to as a “what have you done for me lately” league, and I get it, lately the guy slotted right below Hunt on this list has largely outperformed Hunt no matter how you slice it. With that being said, this race doesn’t just take into account the last month, we’re looking at everything you’ve done up to this exact point of the season equally, and what Hunt did in the first seven weeks of the season was so special that it’s allowed him to stave off his offensive competitors for at least one more week. Hunt no longer owns an elite overall grade but he still ranks second among halfbacks and the rate in which he’s forced missed tackles this year has been, in a word, impressive: Hunt has forced 61 missed tackles on 220 touches this season, Le’Veon Bell is second among running backs with 42 forced missed tackles, he’s touched the ball 313 times. PFF Elite Stat: Kamara leads all running backs with a 122.9 elusive rating. Kamara’s overall grade has steadily risen since the Saints traded Adrian Peterson during their bye week as he’s put up an overall grade of 80.0 or better in five of seven games since Week 6. Kamara is the only running back in the league to be averaging at least 4.0 yards after contact per carry (4.03) and good things tend to happen when the Saints hand him the ball: Kamara has earned either a first down or touchdown on 39.0 percent of his carries this season, the best rate among all RBs and more than double the league average (19.2). There is a very strong chance – given current trends – that Kamara jumps into the top-3 in next weeks update of this race, will the Saints end the season with both our top offensive and defensive rookies? PFF Elite Stat: King has made 15 stops in coverage this season, the third-most among all cornerbacks. King maintains his fifth spot within this race but not for a lack-of-effort to move up, he’s raised his grade 3.8 points since Week 10 when he was also in the fifth spot here with an 83.6 overall grade. King has posted an overall grade of at least 80.0 in four of his last five games. After returning his first ever career interception for a touchdown this week, King has now scored more touchdowns than he’s surrendered in coverage, as he’s one of just nine cornerbacks to have spent at least 290 snaps in coverage this season without allowing a score. PFF Elite Stat: Ramczyk ranks 20th out of all offensive tackles with a 95.9 pass blocking efficiency rating. Ramczyk makes his debut this week in the top-10 after he comes off a practically-elite 89.9 performance in Week 12 against the Rams. His place on this list is buoyed as he now ranks eighth among all tackles for the season in terms of overall grade and he’s excelled as a run-blocker, where his 84.1 grade ranks fifth. Ramczyk has scored 70.0 or better in 8-of-11 games so far to start his career and he’s earned a positive grade on 12.6 percent of his run blocks this season, the seventh-best rate among 73 qualified offensive tackles. PFF Elite Stat: Tomlinson ranks 21st out of 121 qualified interior defenders with 17 run stops this season. Tomlinson has emerged as the premier run-stuffer from this year’s draft class and he’s separated himself a good-ways from the pack. The 55th overall pick this past May currently ranks 18th among interior defenders with an 85.4 run defense grade and he’s one of just three rookies (out of the nine who’ve played in at least 200 snaps) this season to rank within the top-75 among all DIs in terms of run defense grade. Tomlinson’s finished just two games all season with a run defense grade worse than 72.0 and he’s posted a run defense grade of at least 80.0 six separate times this season. PFF Elite Stat: There have been 19 running backs who’ve been targeted at least 35 times in the passing game this season, McCaffrey leads that group with a 1.67 drop rate – he’s dropped just 1-of-60 catchable passes this season. McCaffrey ranks 10th among all RBs in terms of overall grade and his 91.8 receiving grade is tops among his backfield peers. He’s finished with a grade of at least 74.9 or better in terms of receiving grade in every game of his career so far and he’s one of just four running backs to have earned a receiving grade of at least 80.0 in at least five games this season. The Panthers clearly didn’t draft him to be a traditional running back and they’ve shown a desire right from the start to get him involved heavily in the passing game. McCaffrey is one of just two RBs to have run at least 300 routes this season and he ranks sixth among all backs with a 30.0 threat rate (the rate at which a player is targeted when they run a route). PFF Elite Stat: Johnson ranks 14th among all safeties with a 7.6 run stop percentage when he is lined up within eight yards of the line of scrimmage. Johnson currently ranks 24th among safeties in terms of overall grade and his 84.0 coverage grade ranks 20th. The third-round pick has been one of the best safeties in football when it comes to preventing completions, his 23.5 forced incompletion rate (the percentage of targets into his coverage where he was directly responsible for an incompletion, whether it be via pass breakup, interception or proximity in coverage) ranks seventh out of the 60 safeties who’ve spent at least 250 snaps in coverage this season. PFF Elite Stat: Lawson ranks second among all edge defenders with a 14.7 pass-rush productivity rating. We are now 11 games into Carl Lawson’s professional career and he’s still yet to go a game without recording multiple pressures, he racked up five (including two sacks) in last weeks game against the Browns. Lawson is averaging 4.5 pressures per game to start his career, putting him on pace for 71 pressures over an entire 16-game season, which is a total that would break the PFF-era (since 2006) record for most pressures by a rookie edge defender in a season, currently held by Aldon Smith who racked up 64 pressures in 2011. PFF Elite Stat: Foster ranks third among linebackers with a 12.4 run stop percentage. Foster and the other guy listed in this section have both graded well enough strictly on per-game performance to belong within the top-10 but due to a lower snap-count they’re going to be withheld until they get some more playing time under their belts. Foster currently ranks fifth among linebackers in terms of overall grade and he’s one of just six linebackers to possess both run defense and coverage grades north of 80.0 – joining a group with Mychal Kendricks, Telvin Smith, Luke Kuechly, Lavonte David and Bobby Wagner. If he sustains this level of play there’s no doubt we’ll be seeing him within the top-10 come season’s end, or maybe even next week. PFF Elite Stat: Garrett ranks 14th among edge defenders with a 12.1 PRP this season. Same deal as Foster: Garrett’s per-game performance to date has been great, we just want to see him do it for at least another game or two before we vault him ahead of some of these other players who’ve performed well over a longer stretch of time. Garrett ranks 14th among edge defenders in terms of overall grade for the season and he joins seven others as the only edge defenders who currently have both a run defense and pass-rush grade of at least 84.0. The first overall pick has been on the field for 145 defensive snaps over the last three weeks after making it onto the field for just 109 over the first nine, at this pace, like Foster, it’ll only be a matter of time before he cracks the top-10.